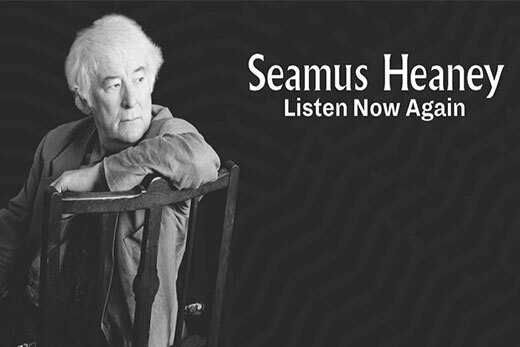 Curated by Emory professor Geraldine Higgins and created over a two-year period in Dublin, “Seamus Heaney: Listen Now Again” opened earlier this year in a cultural space at the Bank of Ireland. Higgins speaks Nov. 7 on the exhibit and how she uses archives in her teaching. Emory professor Geraldine Higgins will deliver a talk at 6 p.m., Wednesday, Nov. 7, in the Rose Library on the critically acclaimed, multisensory exhibition, “Seamus Heaney: Listen Now Again,” that she curated in Ireland – and how she is using that experience in the classroom. At the Rose Library event, Higgins will discuss the acclaimed exhibition that takes visitors on a multisensory journey through Heaney’s poetry, following a thematic path that couples the chronology of Heaney’s life and work with the four elements: earth, fire, water and air. The exhibition boasts audio readings, videos and stations displaying drafts of Heaney’s work, making his genius more accessible by encouraging visitors to take a deep dive. In the classroom, Higgins turns to the power of archival material to ignite a spark of possibility within her students. This semester, she is teaching a graduate course, “Exhibiting Yeats and Heaney,” requiring students to research the life and works of the two major poets before considering the process and politics of exhibitions.